CMOS Monolithic Active Pixel Sensors (MAPS) are charged particle tracking devices, integrating on the same silicon substrate a radiation sensitive detector element with its front-end readout electronics. Standard microelectronics CAD tools are used for their design and modern submicron or deep submicron commercial CMOS processes for the fabrication. After production the device is directly ready to be employed without any use of complicated and expensive post processing like bump-bonding. Initially all prototypes of Monolithic Pixel Sensors were fabricated using a CMOS process version providing an epitaxial type of substrate. In this substrate type a thin (~10μm) lightly p-doped silicon epitaxial layer is grown on a heavily p++ doped thick (~500μm) supporting structure. On top of the epitaxial layer, structures of n+ and p+ wells are formed, providing surface for CMOS transistors implantation (Fig.1). As result, incoming beam after a thickness of material shown a divergence greater than the initial. Fig 1. Cross section of silicon wafers used for the fabrication of CMOS monolithic pixel sensors. On the left, the structure of epitaxial type wafer is shown. 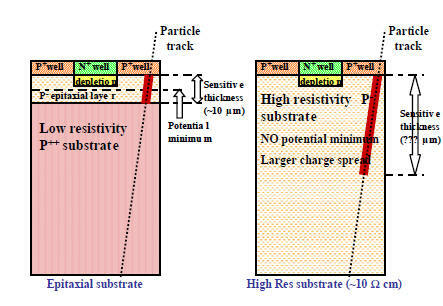 On the right the non-epitaxial, high resistivity wafer is presented. In the original MAPS implementation, this epitaxial layer is used as a detector radiation sensitive volume, with a diode Nwell/Pepi working as a charge collecting element . The detector is only partially depleted in the vicinity of the Nwell/Pepi junction (1-2 μm in depth), so the charge is collected mainly through a thermal diffusion mechanism. However due to the particular doping profile (P++substrate/P-epi/P+well), there is a potential minimum in the middle of the epitaxy limiting the volume spread of diffusing electrons created by the radiation absorption. These electrons may move only along the plane parallel to the surface and are rapidly collected when passing close to the collecting diode junction, with a typical collection time of the order of 100 ns. The detector active volume is limited in depth to the epitaxy layer only, because of the small lifetime of charge carriers inside a p++ substrate. Therefore the total amount of available charge created by an impinging minimum ionizing particle amounts to a few hundreds electrons only, for a typical epitaxy thickness of the order of 10 μm. Several epitaxial CMOS processes have been used in the past, providing MAPS with rather outstanding MIP tracking performances. In the recent years even more MAPS are fabricated using a non epitaxial layer and an high resistivity substrate. The cross section of such a substrate is shown in Fig.1. In this case a supporting silicon wafer is uniformly p doped and is directly used as such for nwells and pwells implantation. There is no potential minimum in the bulk, therefore a larger charge spread is anticipated. Contrary to epitaxial substrate type, the sensitivity region has no clear limit in depth and this effect increase the total amount of charge collected on the nwell/psubstrate diode, compensating for a larger spread. D.Passeri,et al. Tilted CMOS Active Pixel Sensors for Particle Track Reconstruction, IEEE Nucl. Sci. Symp. Conf. Rec. NSS09 (2009) 1678. July 2006.